This is a question I get asked a lot at conferences I spoke. My simple answer has to be this. What I mean by designers is people who have the educational background of design disciplines such as graphic, products, indutrial, interaction design etc. While the terminology of these disciplines may change as design schools are adapting themselves in the changing world, but the basic elements of a designer, in my opinion, are: whether they are trained to observe users and being able to craft ideas in a tangible format. There are three reasons why you need to hire designers in building innovation capability in your organization. 1. Designers are trained to solve problems from the users’ perspective. That’s what ‘design’ is all about; solving problem for the users, not the from the business perspective. 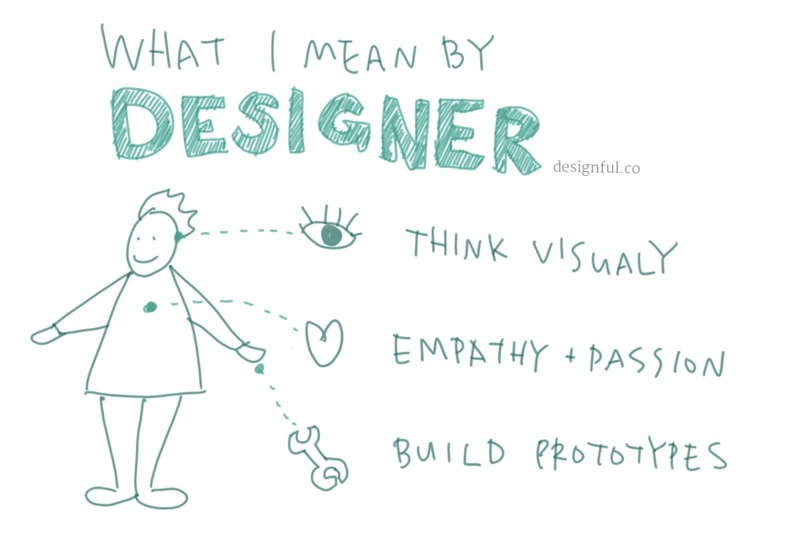 Designers have natural empathy towards users, the design education equips them with user-centric mindset and tools. They have unique abilities that visualise the solution in their head. This accelerates the innovation process by closing the gap between what we learn and how we might incorporate the insight in the solution. 3. They build prototypes to learn and improve quickly. They make the possible ideas tangible by building prototypes quickly. This allows you to test with the customers, learn and improve quickly. I often use ‘T shape’ as an analogy to describe this kind of people. 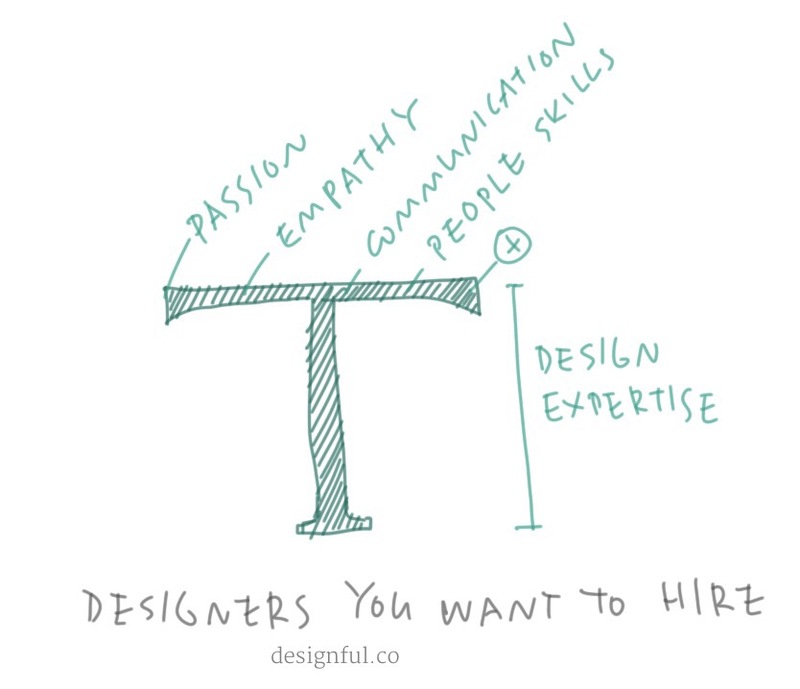 Who owns the vertical line of design expertise of one of the disciplines and the horizontal line of empathy and passion. For example, one of the my team members has a exceptional skills in visualizing ideas. She has a great sense of aesthetic, up-to-date with the visual design trend and being able to produce an elegant visual solution. Another member of my team is a master crafting physical things. He has a deep understanding of different materials and can produce a egornomic design solutions for physical space. And they both possess natural empathy for users and constantly ask themselves how their design can be better to support the users. Do they need to have the industry knowledge? It can help, but not necessarily. Actually the fresher they are to your industry, the better it is as they are in the better place to be user-focused and likely have new perspectives to the problems you need to solve. These are the essential qualities I identified throughout my career of driving customer experience initiatives in the organizations. But in order user their skills to the full potential to drive innovation, designers need to be developed and supported. Develop their soft skills such as communications and people management, as their role is to mobilize the people in the organization to lead customer-centricity. Place them in the right structure where they can be involved in the early process of innovation and strategic discussion.